I loved Kari Edgren's first installment in the Goddess Born series, Goddess Born, and could not wait to read book two. Read my review of Goddess Born here. Edgren combines historical fiction, fantasy, paranormal elements, and romance in the Goddess Born series. And she does it with aplomb. These books are clean romance novels, which is such a nice change of pace for me. I love it when I can share a book with my mom and not have to blush when we talk about it. A Grave Inheritance begins about three months after Goddess Born ends. Not to worry, though, Edgren provides a good recap of the events occurring in the gap between books. This book starts off with a bang and the fast pace continued for the entire story. There was much more action in A Grave Inheritance than in Goddess Born. It made for an exciting read, one that was difficult to put down. There was a really exciting and unexpected turn to the plot in this story. Edgren really shocked me, and I love it when authors do that. 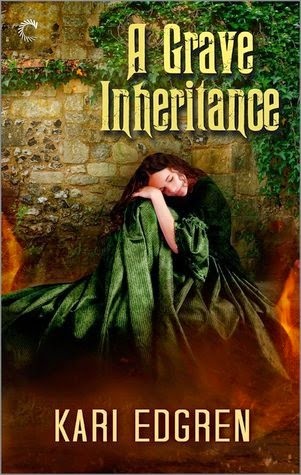 I thought that A Grave Inheritance had more depth and more intensity than its predecessor. It made the book even more thrilling to read. There was a focus on other Goddess born, which was so neat, because Selah finds out she's not alone, that there are other Goddess born out there. I loved that, and that she found a sense of community among other Goddess born. For an orphan who has to keep her true identity a secret from nearly everyone she knows, Selah deserved to be around people who truly knew and understood her. My one complaint about A Grave Inheritance is that it ended on quite a cliffhanger. I literally cannot wait until book three comes out. I highly recommend the Goddess Born series!